From ADSL filters to extension cables and doublers, our expansive range of telephone accessories includes everything you need to customise your home or office telephone setup. In addition to a broad choice of home telephones, fax machines and other telecommunication equipment our range includes telephone accessories that will allow you to improve connectivity around your home, ensuring your day-to-day telephone and internet use is matched by a perfectly tailored setup. 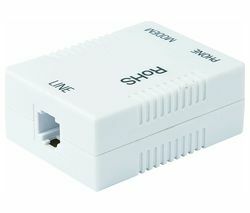 We have a huge choice of Logik telephone accessories including highly affordable modem extension cables that will help to ensure that everyone in your home or work is connected. 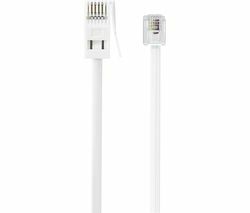 The Logik LUFEX1011 Ultra Flat Extension Cable Kit is another invaluable telephone accessory that gives you the flexibility to arrange your telephones and computer equipment however you like, wherever your phone socket is situated. And if you don’t like the idea of unsightly cables littering the floor, fear not – the Logik extension cable kit comes with handy self adhesive tape that will enable you to keep cables perfectly discreet. All our telephone accessories are easy to install and competitively priced, meaning you can customise your home or office setup cheaply and easily.